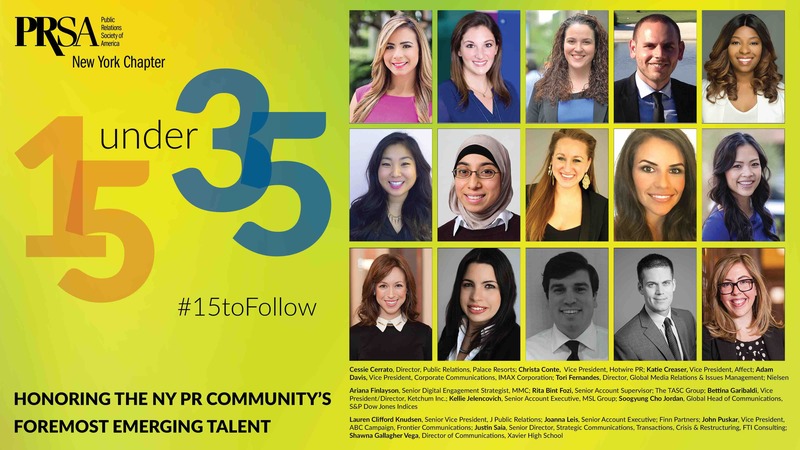 NEW YORK, NY--(Marketwired - June 01, 2016) - The New York Chapter of the Public Relations Society of America (PRSA-NY) has selected its inaugural recipients of the PRSA-NY 15 Under 35 Awards. #PR #PRPros #15toFollow. Hailing from corporations, agencies and academia, the 2016 recipients epitomize the spirit of the award, which recognizes the most inspired and inspiring young talent in the New York metro area public relations industry. Fearless, passionate, innovative and strategic were some of the qualities often cited in the winning nominations. "Her vigor and passion are an inspiration to her clients, the media and her team," said one nominator of a winning recipient. "She approaches each day with a smile, compassion and a driven attitude that has allowed her to build lasting relationships," noted someone else when nominating another one of the 15. Still another winner was cited for, "Fearlessly and creatively breaking new social ground," while one nominator said that her winning nominee "operates at a level far beyond her ten years in the business and her work is invaluable." New York's place as the global center of media afforded the 15 Under 35 recipients with leadership opportunities, which they seized with enthusiasm. This year's winners hail from blue chip companies like S & P Dow Jones, IMAX, Palace Resorts and Nielsen. They have led social media campaigns for major consumer brands like COVERGIRL, managed crisis communications plans globally, and played integral roles in influencing coverage of major global news events like the Pope's visit to New York City. Winners were likely to turn up in classrooms inspiring students, in board rooms counseling on digital content and strategy, on the phone building relationships with journalists and advocates, and in volunteer settings lending their insights and passion to charities and industry groups. "Today's public relations business demands we leverage the very best of our younger professionals," said Bill Doescher, Board President of PRSA-NY. "It's exciting to see so many young people having more influence and impact than ever on the daily operations and long-term future of public relations. The entries we received were inspiring. It was difficult to pare our list down to 15." Bettina Garibaldi, Vice President/Director, Ketchum Inc.
Award winners were employed at an agency or in-house and have at least five years' experience. Winners will be honored during an awards luncheon on July 21 at Aureole. They'll also be given a seat on a newly created PRSA-NY Young Professionals Advisory Committee, part of the PRSA-NY Board of Directors, through December 2017. Winners will also be acknowledged during the 2016 PRSA-NY Big Apple Awards, one of the NY PR profession's biggest nights, on June 2 at the Mandarin Oriental Hotel at Time Warner Center. The Public Relations Society of America, New York City chapter is one of the founding chapters of the Public Relations Society of America, the world's largest professional organization for public relations practitioners. Founded in 1948, the chapter serves the interests of public relations professionals working in business and industry, counseling firms, government, associations, hospitals, schools, professional services firms and nonprofit organizations. Chapter board and committee members are volunteer who live and work in the New York metropolitan area. For more information, please visit prsany.org. Follow PRSA-NY on Facebook, Twitter and LinkedIn.